Just a few flaws can easily spoil a bathroom. That’s why remodeled bathrooms are at the top of many people’s wish lists, and why you should leave renovations to a trusted home contractor. At Optimum Construction, we provide bathroom remodeling services in Montgomery County and the surrounding areas. No matter the size of the bathroom remodel project, we always have a focus on delivering exactly what the customer wants. 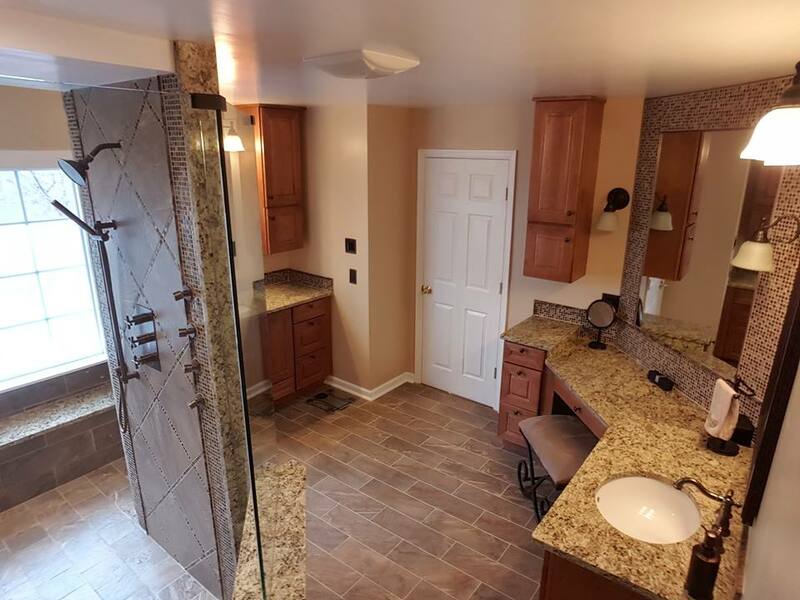 If you’re looking for a bathroom remodeling contractor in Maryland who not only does top-quality work, but also sticks to a budget and schedule, you’ve come to the right place! Request a consultation and speak with our professional bathroom contractors to get started on your bathroom remodeling project in the Potomac area! Whether you want to renovate the bathrooms in a fixer-upper you recently purchased, or it’s time to update the bathrooms with clean design and new plumbing, Optimum Construction can make it happen. Here at our Clarksburg, MD office, we have some of the best bathroom remodeling specialists in the entire DC area. Get bathroom remodel inspiration! Browse our gallery to see some of the enviable master bath renovations we’ve completed! Contact our professional bathroom contractors in Bethesda, Potomac, DC, and more! You may have a crystal-clear picture of the bathroom you want, or perhaps you just know that you need a contractor to remodel a bathroom for resale purposes. At Optimum Construction, it’s our job to deliver a finished product that meets and exceeds your wishes. Bathroom remodeling is as much about the small details like grout color and faucets, as it is about the big decisions like the bathroom layout. Our Montgomery County contractors are here to serve you with a customer-centered experience. Why Call Us for Your Montgomery County Remodel? Bathroom renovations call upon every tool a contractor has. Not all home improvement contractors necessarily have the expertise in tile work, plumbing, ventilation, and high-end quality finishes that you probably want in your new bathroom. Optimum Construction is a full-service custom builder that serves Potomac, Bethesda, Rockville, and all of Montgomery County and the DC metro area with custom bathroom remodeling services. Optimum Construction is the partner you need with expertise in architectural design, bathroom layouts, custom cabinets, shower and tub installations, and everything else that goes into bathroom remodeling. Sit down with us for a consultation about bathroom remodeling and any other home renovations you’re interested in making. Optimum Construction serves Montgomery County, Maryland, and Washington, DC. Contact us online or call (240) 422-9990 to get started on the bathroom remodel of your dreams! We provide bathroom renovations to MD, DC, and throughout Montgomery County.